Launched in 2006, n — yup, just “n” — is a DTH (direct to home) satellite television platform, a lá DirecTV, in Poland, offering nearly 100 channels from around the world, over 20 Polish language channels and a new range of premium channels called nPremium HD. The package includes four channels covering the latest Hollywood movies, sporting events, documentaries, and more, as well as a fifth on-demand channel. Warsaw, Poland-based mamastudio designed the nPremium HD on- and off-air look, building on top of the existing n logo. 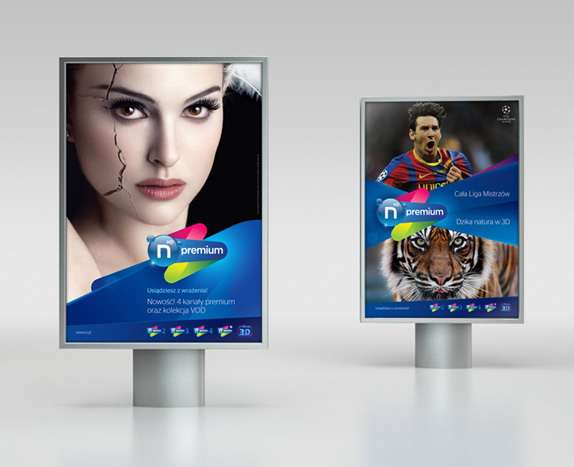 The nPremium HD brand identity is dynamic and modern. The various elements provide a diverse and dynamic feel that refer to the rich and varied programming of the channels. Rich colors and smooth color transitions energize. We wanted the viewer, at first glance of the new visuals, to experience the excitement, energy and joy that comes from watching quality television. The nPremium HD logo, in addition to the primary version, also operates in several modified versions giving additional creative possibilities for animations of the logo and identity elements. The logo is “alive”, making it stand out and easy remember. The primary version of the nPremium HD logo is spacious and three-dimensional. It is a direct reference to the depth of image, the richness of content and the overall quality of HD television. It is also a nod to the future of 3D television. There is nothing subtle about this identity. It very clearly is about making a splash and looking cutting-edge and contemporary and it uses all the shades in the rainbow and twists and turns of threedimensionality to achieve that. It’s easy to turn to our default reaction on these executions and discard it. But if you put yourself at the end of that spectrum, away from the Nikes and Targets and IBMs, this is a fairly interesting solution. The logo itself is awkward looking in its static form but in its main use, animated on television, it looks pretty great. Of the animations shown, most have that riding-a-rollercoaster effect where you are meant to feel the twists and turns, which is fine, but the better effect is when the logo comes in full view and gently floats as it comes into its full form. The tubes serve as a good way of framing information too. Not necessarily pretty or elegant but a proper extension of the concept. Overall, it’s not something I would call my favorite, but in the genre it exists on, it’s one of the nicer ones. Launched in 2006, n — yup, just \"n\" — is a DTH (direct to home) satellite television platform, a lá DirecTV, in Poland, offering nearly 100 channels from around the world, over 20 Polish language channels and a new range of premium channels called nPremium HD. The package includes four channels covering the latest Hollywood movies, sporting events, documentaries, and more, as well as a fifth on-demand channel. 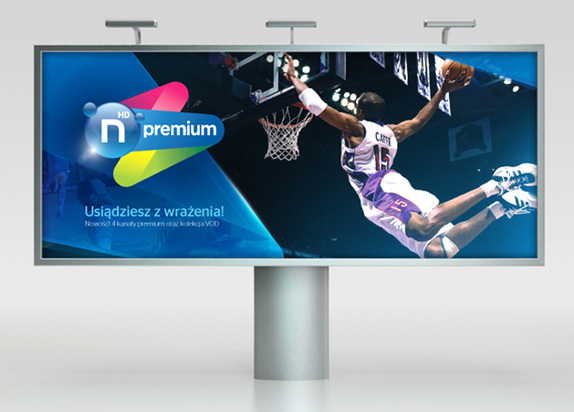 Warsaw, Poland-based mamastudio designed the nPremium HD on- and off-air look, building on top of the existing n logo.